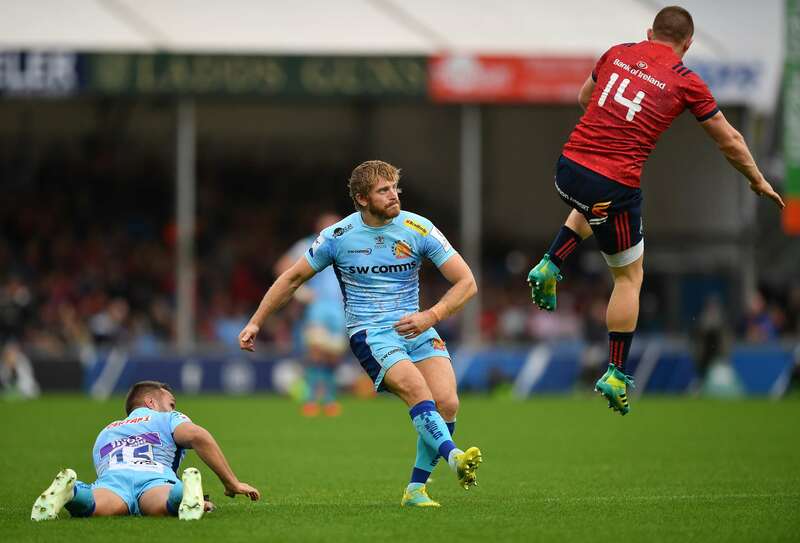 Having blown away all that have stood in front of them so far this season in the Gallagher Premiership, Exeter Chiefs were unable to kick-off their Heineken Champions Cup with similar reward against visiting Munster. Rob Baxter’s side huffed and puffed in patches – and they could easily have won it at the death – but in the end they had to settle for a share of the spoils against the Irish province on their first-ever visit to Sandy Park. Luke Cowan-Dickie’s converted first half try, plus a penalty from Gareth Steenson, gave the Chiefs a slender 10-3 lead at the break. However, Joey Carbery was able to add to his first half penalty when he landed the crucial conversion to CJ Stander’s try just past the hour mark. Even then, either side could have snatched victory, but in truth that would have been tough in a contest where these two heavyweights rivals slugged it out, pound for pound, in a full-blooded 80-minute shift. Munster, who had arrived through the eye of Storm Callum 24 hours earlier, won the pre-game coin toss and opted to go head-on into the gale-force wind that swept down the length of the Sandy Park turf. The visitors – no strangers to dominating in this very competition, having twice won it in the past – happily soaked up the early Exeter pressure, winning a couple of key turnover penalties through the astute work of skipper Peter O’Mahony at the breakdown. The Ireland and British Lions forward was a constant menace throughout, disrupting life for the Chiefs pack who, for much of this current campaign, have spoon-fed their back division ample ball in which to run riot. Baxter’s men took for the first quarter at least to really get going, but it was the home side who broke the game’s deadlock, Irishman Steenson firing his side in front with a penalty from in front of the sticks after O’Mahony had been singled out by French referee Jerome Garces for straying offside. Munster did their best to counter Steenson’s shot with a strength-sapping, 30-phase wave of attacks deep inside the Exeter 22. The Chiefs, though, were having none of it, standing firm under heavy bombardment and eventually clearing the threat down field. Undeterred, the Irish outfit came again, this time doing enough in attack to secure a penalty that Carbery was able to dispatch with ease after the home side were caught offside just metres from their own try-line. With little to choose between the two sides at that point, it was the Chiefs who raised their levels heading towards the break. Henry Slade almost set Santiago Cordero off down the left flank, only for the ball to catch on the wind and sail out of the grasp of the speeding Argentinian. Then, with just minutes to the interval, the Chiefs found a way through the Munster defensive line. Using advantage off a mighty scrum deep inside the visiting 22, the hosts do what they do best. Their simple, yet highly effective pick-and-go game, got them to within sniffing distance of the line. One raid, two raids, three raids and they were over. England international Cowan-Dickie emerging from the mass of bodies to take the acclaim of his team-mates, many of whom have produced the power-plays to set him up. Steenson’s conversion was nailed, but so too was the Dungannon-born playmaker who appeared to be felled in the act of kicking by an ugly charge from Munster’s Andrew Conway. Exeter’s leading points-scorer of all time was pole-axed to the floor, creating fury amongst many inside the stadium. TV replays flowed aplenty, but Garces was unmoved and gave no sanction. With the wind showing no sign of abating, the Chiefs knew they would need to put in one huge shift during the second period to keep their lead intact. Munster, though, had other ideas and with half-backs Duncan Williams and Carbery looking to pull the strings, they looked to pin their rivals back at the earliest opportunity with a couple of probing kicks in behind. But, just as they had shown earlier in the contest, the Chiefs were standing firm in defence and having soaked up the initial visiting pressure, it was Exeter who fashioned the first real chance of the half. Dave Ewers and Don Armand led the charge with a powerful break through the middle of the Munster line, they teamed-up with the lively Matt Kvesic, whose secondary charge was thwarted at the crucial moment by some last-gasp intervention play from Carbery. At the other end, Munster flanker Chris Cloete thought he had pulled his side back into the game with a try in the left-hand corner off a line-out move. However, the fact his path was cleared by two team-mates obstructing the Exeter tacklers meant the score was quickly chalked off. Up front, the battle remained an intense as minute one. The breakdown battle was fascinating, if not a little frantic, as Garces allowed the on-field poachers from both sides to feed off any kind of scraps. By the hour mark the Chiefs had put in over 150 tackles to repel their rivals, but still they held their lead. That was until Stander got in on the act, the Ireland and British Lions forward powering his way over from close range. It was a carbon-copy of Exeter’s first half score, where they pummeled their way to the whitewash with some abrasive carrying. 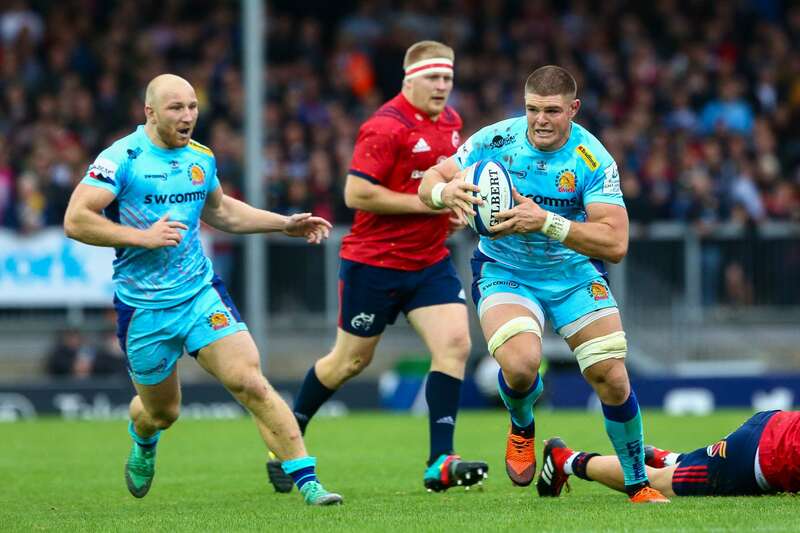 Munster’s cause, however, was helped in the build-up as the Chiefs were left short in the line after Ewers and Sam Skinner had collided full force under their own posts. Both men would depart as Carbery stroked over the conversion for head injury assessments. Ewers would return to the fray later in the contest, but for Skinner his day was run. As the minutes ticked by, so both sides shifted to almost shut-out mode. Neither were willing to cough up the error that would gift their rival victory. A forward pass from Stu Townsend gifted the visitors a decent opportunity of a scrum midway inside the Exeter half, but they could not capitalise. Then, with the clock in the red, it was the turn of Carbery to make an untimely mistake. His intended clearance caught on the wind and propelled it’s way dead at the North End. All of a sudden, the Chiefs had the platform from which to weave their magic. The resultant scrum saw the Chiefs apply a hefty shove, but Garces refused to re-set the set-piece, meaning the home side were forced to go wide. They went left, they went right. They even went down the middle, but just as they were poised to strike, a crucial knock-on just inches from the line denied their hopes of a famous win. Munster celebrated as if they had won the contest, while the Chiefs were left to rue a rare missed chance. In the end, two points apiece was probably the fair outcome. However, both will be looking to power on next week in Europe as the Chiefs head to Castres and Munster welcome Gloucester to Thomond Park. Chiefs: P Dollman; J Nowell, H Slade, I Whitten, S Cordero; G Steenson (capt), S Townsend; B Moon (A Hepburn 58), L Cowan-Dickie (J Yeandle 58), H Williams (T Francis 58); D Dennis (O Atkins 43), S Skinner (L Cowan-Dickie 65-74); D Ewers (T Lawday 65), D Armand, M Kvesic. Replacements (not used): J Maunder, J Simmonds, S Hill. Munster: M Haley; A Conway, D Goggin (S Arnold 61, JJ Hanrahan 69), R Scannell, D Sweetnam; J Carbery, D Williams (N Cronin 74); D Kilcoyne (J Cronin 46), N Scannell (R Marshall 57), S Archer (J Ryan 46, S Archer 80); J Kleyn (B Hollan 61), T Beirne; P O'Mahony (capt), C Cloete (T O’Donnell 61), CJ Stander.